In It’s Even Worse Than You Think, Johnston exposes shocking details about the Mexican border wall, and how American consumers will end up paying for it, if it ever gets built; climate change, and all about Scott Pruitt who spent much of his career trying to destroy the agency he now heads; stocking—not draining—the swamp, despite his promise to do the opposite, Trump has filled his cabinet with millionaires and billionaires; and the Kleptocracy, where Donald Jr. and Eric run an eyes-wide-open blind trust of Trump holdings to avoid the appearance of conflict of interest—but not the reality. With story after story, It’s Even Worse Than You Think "diagnoses the Trump administration as a…government by the least qualified and most venal among us” (The Washington Post). This is “a momentously thorough account of President Trump’s alarmingly chaotic first year in office…a precise and fiery indictment of an unstable, unethical president that concludes with a call for us to defend our democracy” (Booklist) and is “urgent, necessary reading” (Kirkus Reviews). 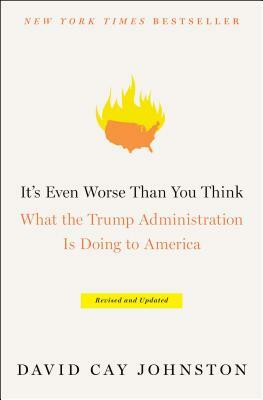 "It’s Even Worse Than You Think shines a light on actions by the White House and Trump-appointed federal officials on climate change, job creation, taxes, race, immigration, and foreign affairs, among other topics, that should concern – and alarm – all Americans."